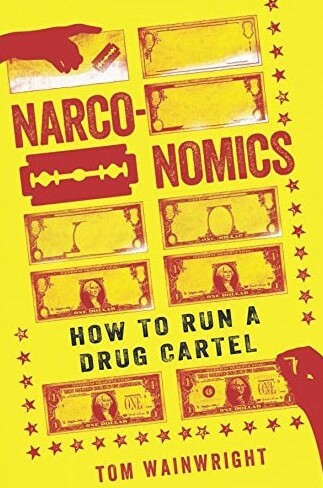 Gary Anderson offers a good review in the Washington Times of Tom Wainwright's Narconomics: How To Run a Drug Cartel. ”Narconomics” is the book that Sean Penn wanted to write. Tom Wainwright may not have interviewed Joaquin “El Chapo” Guzman, but he did talk to drug kingpins every bit as ruthless and intimidating in writing this book. Along the way, Mr. Wainwright also talked to cops, hitmen, national presidents and addicts. He is one of the luckiest journalists alive just to have survived his research. The work that he has produced argues his thesis that the drug industry is run on very similar lines to companies such as McDonald’s or Wal-Mart; he makes a convincing case. Mr. Wainwright is an investigative journalist who is an editor for the Economist magazine; he began this project while covering Mexico, Latin America and the U.S. border for that publication. Mr. Wainwright argues that most successful drug cartels operate like Wal-Mart in that they have a virtual monopoly on the product at the source of supply. The farmers who produce the basic cocoa, poppies or marijuana have no choice but to sell to a single buyer in their respective areas. This helps to explain why drug prices remain relatively inelastic and why eradication efforts fail; there are always sellers someplace to sell at the buyer’s price. Like Mc Donald’s, some cartels such as the Mexican Zetas have also found franchising to be an effective business model. This is a symbiotic relationship. The cartel finds a local criminal gang that wants to expand its business. That gang knows the local territory and has established relationships. The franchise gets the brand name of the major cartel and its protection against other cartels for a cut of the franchise profits. Like McDonald’s and Burger King, the cartel has to maintain quality control. The difference between quality control in the fast food franchise business and the drug trade is that a drug franchise that comes up short may find its members hanging from a highway overpass.